Explorers! Welcome to this Strike Event Guide! This time, we’re in for a challenge as three high level superhybrids challenge us! Let’s see how we can overcome these dinosaurs! Huge thanks to our artist Orange Heart for providing us with this amazing infographic! The recently buffed Monostegotops isn’t one to be taken lightly. A decent health pool combined with 30% armor, decently high attack and a good movepool make this thing quite the problem if you’re unprepared. Luckily, Monostegotops isn’t immune, so we can bleed this guy out. Using bleeding moves like Lethal Wound, Gashing Wound and Swap In Wound should give you the edge against this behemoth. Immunity and Defense Shattering/Armor Piercing is also good against this creature. Dinosaurs like Postimetrodon, Indominus Rex and Secodontosaurus are good candidates to taking this dino down. Beware of its 20% crit chance as you face it! It might result in some rage if you don’t take the crit chance into consideration! This brightly coloured sauropod might seem like a bit of a weakling offensively with its low attack stat, but don’t be fooled. This dinosaur can alternate a Rampage and Decelerating Impact at will, and combined with its 0.5 counterattack, Gigaspikasaur can rack up damage quickly. It’s high health pool and 40% armor also makes it resistant to a lot of moves. Combine that with the shield put up by Short Defense, and you’ll get a real issue with damaging it. Bring either bleeders or chompers to deal with this one. Bleeders like Suchotator, Spinotasuchus, Dimodactylus and Dimorphodon are good options. Thoradolosaur, Trykosaurus, Tyrannosaurus Rex and Tyrannolophosaur are some good chomper options. Beware of it’s chomper trolling 109 speed though! It will outspeed every chomper in the game unless slowed! This, in my opinion, might be the scariest dinosaur of the bunch. This purple anklebiter got a major buff this update, and it’s going to show you all the power it has obtained in this strike. It has a lot of versatility: Distracting, Nullifying, Defense Shattering and Immunity to name the highlights. Immunity is especially an issue, as it means you can’t bleed, distract, stun or slow it. This means that the 128 speed Magnapyritor is most likely going to outspeed everything you bring that isn’t 129 or above speed. This dino has no really clear counters, you just have to hit it as hard as possible with 129+ speed dinosaurs like Erlidominus, Velociraptor, Pyrritator and Spinotasuchus. If Magnapyritor doesn’t use Nullifying Impact on T1, you might have some luck cloaking with your Erlidominus. A level 21 Erlidominus using a cloaked Rampage kills Magna, relying heavily on the dodge. If Magnapyritor hits through the Cloak or uses Nullifying Impact, your Erlidominus will be dead before it can get a hit off. Only use this if you are feeling really lucky and you know the Magna doesn’t use Nullifying on the first turn. As these dinosaurs are quite powerful, I’m going to list off some dinosaurs that might be good to use against these dinosaurs. They aren’t in any order of usability, keep this in mind while selecting your dinosaurs! Suchotator: If played well, it can trade with either Monostegotops or Gigaspikasaur. If you want to lose one dino at the cost of making a LEGENDARY dino drop, this is the best way to go. 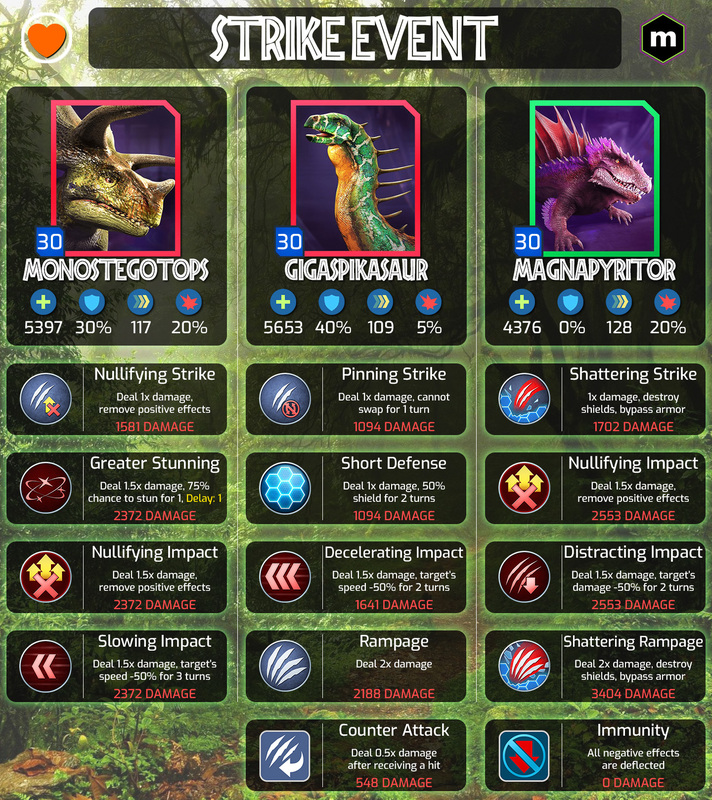 Thoradolosaur: This high-damage chomper gets a mention for its insane damage output. If you have one of these, use it against the tanks. Erlidominus: The best Magna counter at the same level, Erlidominus is able to outspeed Magnapyritor and hit it for massive damage. Even a fresh Erlidominus hits for about half of Magnapyritors health! If you have one, use it! Dracoceratops+Dracorex GEN2: These two always come around the corner with every strike event. If you need a way to get the final hit in, these two are by far the best option if you’re slower. Spinotasuchus: This dinosaur has the advantage of being faster than everything this strike has to offer, and it can bleed. If you have this dino at high level, it’s an amazing dino to use. Beating this Strike Event will reward you with thousands of coins and loads of DNA. The amount of each varies on your player level. Ludia has once again proven to us that they aren’t afraid to make these ‘Boss Strikes’ quite hard. We really need to work for our Epic Incubator, and this Strike Event is the prime example. Have you beaten this Strike Event? Let us know how you did it! Have a good day Explorers!